Soulful, passionate, stirring…these are the words most often used to describe Kirk’s music. Forged from his Memphis, (TN) gospel roots and his 1980‘s initiation into the thriving Houston, TX nightclub scene, Kirk’s big, rich tenor sound is unmistakably his. The 80’s were highlighted by Kirk’s stepping out of his blossoming sideman role and forming his own band. It was there that Kirk ultimately developed both his “voice” and songwriting in the crucible of the local club scene––especially at a rooftop club called Cody’s. 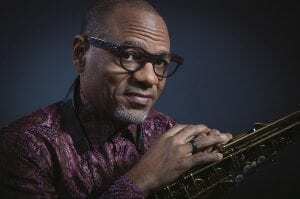 It was also in Houston where jazz pianist Bob James “discovered” him and brought him on tour, which led to five successful albums with Columbia Records, including Cache, Kirk’s first #1 album. As well, Kirk and Bob received a Grammy nomination for their collaboration album, Joined at the Hip. After moving to Los Angeles, Kirk became an in demand session player for top artists like, Barbara Streisand, Al Jarreau, Luther Vandross, Larry Carlton, Quincy Jones and most notably, Whitney Houston, amongst many others. It’s his sax heard on the mega-hit, “I Will Always Love You.” Kirk soon followed that career high point with his phenomenal hit album released on Warner Bros. Records, For You, perhaps the most successful of over 25 solo recordings to date; others include his eclectic, and much lauded, Gospel According to Jazz series, (Chapters 1, 2, 3 and 4). In addition to his many solo projects, Kirk was also a member of the popular soul/jazz group, BWB, which features Kirk as the “W” of the group with Rick Braun (trumpet) and Norman Brown (guitar). An ordained minister, Kirk has earned a Masters of Art in Religion. It’s in this spirit that he serves his community in various ways when his touring schedule allows. There is also his daily fifteen minute podcast, Bible In Your Ear (BIYE), in which he invites you to listen along as he reads through the Bible in a year. In addition to music and ministry, Kirk has a passion to educate young, aspiring musicians and is currently engaged as a music professor at Visible Music College in his hometown of Memphis.